First, the stash report! 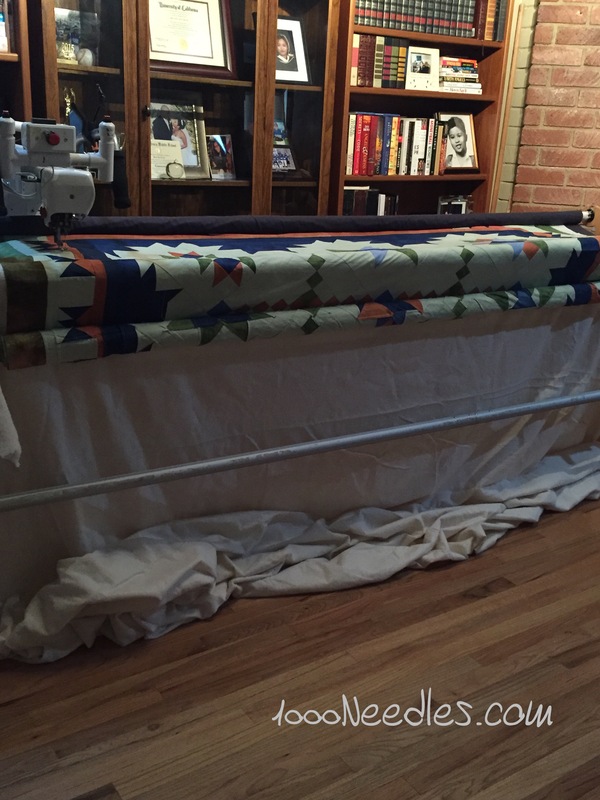 Went to my LQS this past week and got yardage for that final side of border #2 of Hampton Ridge. I know I got way too much at +4 yards. But I didn’t want to cut and piece the border. Even with that info, I’m sure 4 yards is way too much but I needed at least 3 yards. So I played it safe. Not a big deal. Now I’ll have plenty of dark fabric to add to my stash! Here’s what I got done from yesterday’s laundry list! On Raining Cats and Dogs. I know, the lighting is horrible but by the time I got around to taking a picture, the lighting outside wasn’t much better. 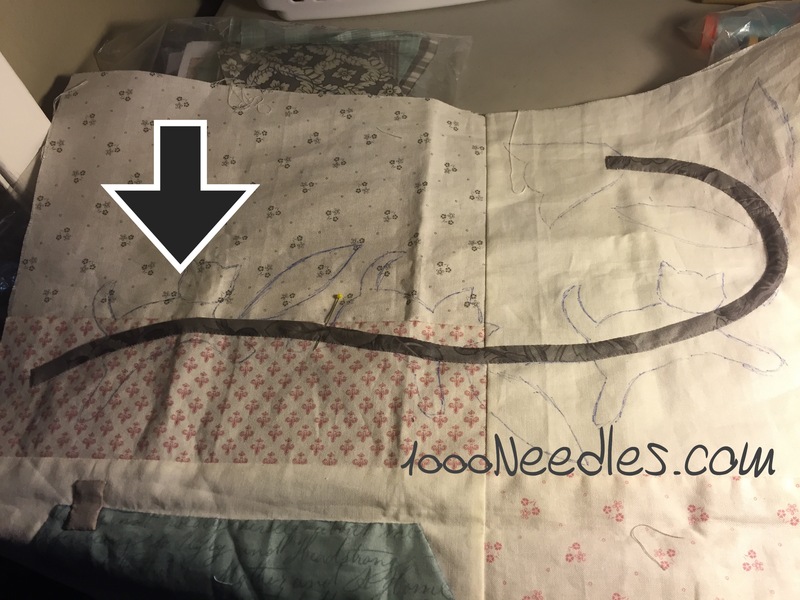 Anyway, if you can see the needle to right of the arrow, the remaining part to applique down is from that needle to the end of the stem towards the left. The plan is to get to that today so that next weekend I can move on to the next bit. For Celtic Solstice, I was able to get the three rows of Block A put together. Now I get to pack it up and set it aside for next month. I realized while I was working on these that it took forever because I was trimming dog ears and then piecing. For that middle row, I was also pinning to try and get those points to match up with the middle of those 4 patches. And I was able to get Tell It To The Stars onto the frame. Yesterday was very productive in my house. Today, I’ve got a lot more running around. The girl is cheering at her school’s open house so I’ve got to wake her up soon to get ready and go. The boy’s harvest festival is today too. But he is not interested in going and we heard that it is supposed to rain today. If that’s the case, he will definitely not want to go out. I’ve got yoga shortly and more studying. I also still want to go to that store where I’ve got a coupon at (it expires today!). Continue to work a bit on Raining Cats and Dogs. Start the quilting on Tell It To The Stars on it. Pull Razzle out and get going on that project for this week. I’m still uncertain about joining Bonnie Hunter’s mystery. I know last week I said I was going to and now this week I’m not sure again. I started pulling fabrics from my stash and I’m not sure I’ve got enough of the colors she chose. I’m waffling, I know, but I love the community around the mysteries each year. That’s the best part. I just don’t think I’ve got the time. Well, we’ll see how I feel on Black Friday. I feel way about Bonnie’s mystery this year. I love the community around the quilts, but I don’t have a lot of time this year. I’ve done them the past 4 years, though, and don’t want to quit now. Looks like a productive week. 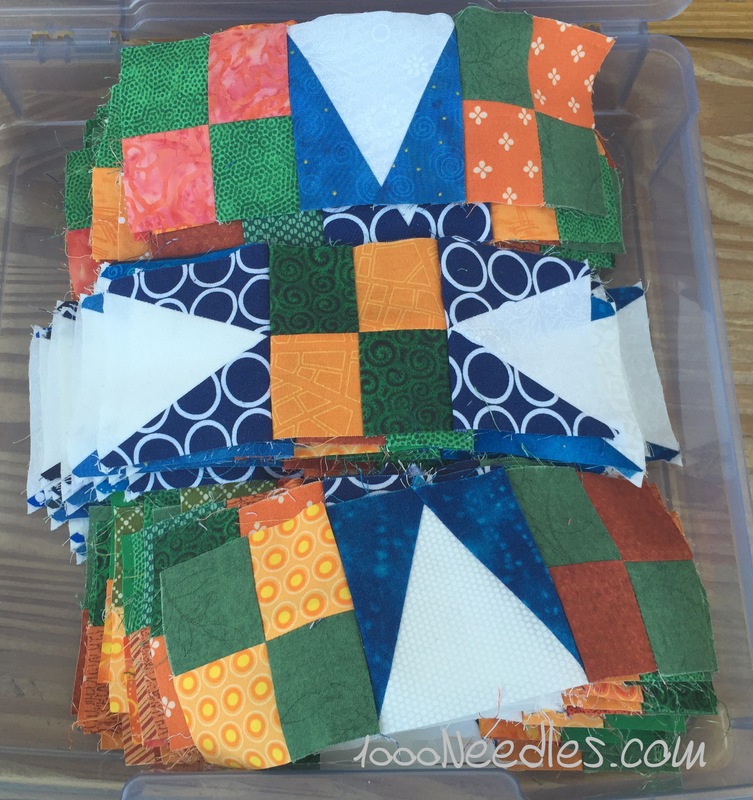 I stay away from Bonnie’s mystery quilts because they are too much piecing. She spoke at my guild last year and I thought she was the best speaker they’d ever had. I’m content to watch others do her mysteries. Sounds like another busy week, which happens when the kids are in school. Sounds like you’ve got a good plan to get hings moving. I’ve pulled fabric for Bonnie’s mystery, but I’m going with a different color palette. The community is a lot of fun and it’s a great way to bust some stash. It was productive! I’m glad you were trimming dog ears. I trim them first thing, before the square is sewn to another piece, because it makes things come together so much better! There’s room for corners to match. You have lots of projects to keep you busy! Have a good week. Hi there, first time at your blog. I like your style! I want to do so many projects but there just is not enough time in the day! Going to look around a bit before I leave.